Non-grid connected test site. A purpose-built Test Support Buoy moored on site acts as a power sink to allow load-dumping of any electricity generated as heat dissipated to air. In addition to the grid connected wave test site at Billia Croo, EMEC also have a wave test site that is not connected to the grid aimed at providing less challenging conditions for scale prototypes. The site provides a more flexible seaspace acting as a stepping stone between the test tank and real sea conditions. The site is located in Scapa Flow, to the south of Kirkwall, and was chosen for its relatively benign waters which reach almost 0.35m significant wave height. The area is 0.4km across and approximately 0.9km in length situated in water depths of 21-25m with a predominant westerly wave regime. At the site EMEC offers developers the use of a bespoke test support buoy. 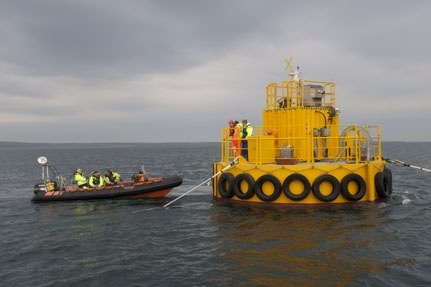 If required, the device under test will be connected to the test support buoy via two umbilical cables: one for power transmission and the other for control and communications. The buoy can relay data by wireless technology allowing developers to monitor performance remotely, as well as dissipating electricity generated by the device. The buoy is also equipped to supply the marine energy devices on test with power and act as navigational aids. Each test site comprises one berth with pre-laid foundation and attachment points, and adjacent ‘blank’ test area. The pre-laid foundations comprise 5m x 5m x 2m gravity-base frames loaded with densecrete blocks for equipment moorings. An area of seabed is also available for rehearsal or deployment of other tools and techniques. As the site is not grid connected, no export cable is present. The EMEC Scapa Flow nursery wave test site is situated in the natural harbour of Scapa Flow south of Kirkwall in the Orkney Islands, Scotland. The two test berths on site range from 21-25m water depth. Harbour Works Licence issued by Orkney Islands Council (OIC). A developer wishing to deploy a device at the test site must provide an outline of the proposed project. This document must also identify any potential device-specific environmental or navigational risks, as well as any proposed mitigation measures. This information will be submitted alongside EMECs application to update their generic Marine Licence, a process which must be carried out for every new development at the site. MS-LOT typically requires 6-8 weeks from receipt of application to issue a licence amendment. EMEC is also required to give OIC at least 21 days’ notice of each new developer wishing to install at its scale sites. Mitigation measures: Where appropriate developers are required to implement their own mitigation measures should activities overlap with sensitive times of the year for marine wildlife. EMEC Scapa Flow Non Grid-Connected Wave Test Site is located in United Kingdom. The following field surveys were undertaken (or commissioned) by EMEC to inform baseline characterisation. Initial site selection: Bathymetry commissioned by EMEC to Netsurvey Ltd.
Water depths ranged from 15 to 30m across the site approximately 1 m deeper than charted depths. Initial site selection: determining biota and sediment particle size. Moderately low energy site. “Sheltered Muddy Gravels” and “Subtidal Mixed Sediments”. The infaunal community was composed largely of deposit feeding species (mainly polychaetes and bivalve molluscs), with only a few crustaceans present. Two common species were Lumbrineris gracilis and Thyasira flexuosa which made up approximately 10 - 20% of individuals at all stations. Background noise levels were in line with that which could be expected for this type of shallow water site. Contributions over and above these conditions were then identified, with the major contribution being the natural sounds from wind/waves and precipitation. The major anthropogenic source was shipping noise from distant static and mobile sources. Local shipping traffic also contributed to the sound field, although this was only present for around 7% of the time. Other sounds identified included a thunderstorm, aircraft and various biological sources. Scapa Flow Scale Site: Environmental Description. 2011. Available [Online] http://www.emec.org.uk/facilities/scale-test-sites/ Accessed 04/11/2014. Harland, E.J. 2013. Scapa Flow Wave Test Site: Acoustic Characterisation. Available [Online] http://www.gov.scot/Topics/marine/science/MSInteractive/Themes/EMEC-Wildlife/Scale-Sites. Accessed 04/11/2014. The following measures were outlined in the Environmental Description. Survey samples sieved and analyzed regarding species and abundance. Study undertaken to assist in setting up the scale site, no further work deemed necessary unless additional or different types of infrastructure are propose. Observations of birds and mammals by EMEC wildlife observers. Raw data is publically available from the link below, however no report has been published. Scapa Flow Wildlife Observations Methodology. 2010. Available [Online] http://77.68.107.10/EMEC_Wildlife/Scapa_Flow/Scapa%20Flow%20Observation%20Methodology%20v1.00.pdf Accessed 04/11/2014.